Who Says You Can’t Eat Pizza On Keto? When I began my keto diet, like most people, I stuck to the very simple eggs, meat and cheese meals. But the weekends would bring pizza cravings, and two years ago, almond flour was not a staple in my pantry. 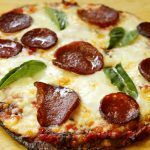 When I began doing research, I discovered the cauliflower pizza crust, and that’s what came to my rescue. It definitely didn’t taste like bread, but it was so amazing to see that it held together like a real pizza. With a good keto marinara sauce and some nice toppings, I didn’t miss the bread all that much. One Cauliflower Pizza Crust. A World of Topping Possibilities. As for the pizza toppings, I used what I had at the time, which was some salami and fresh basil. But there’s a world of possibilities there. I’d love to get some sausage meat, mushrooms, bacon, olives, garlic, bell peppers… I could go on and on. I will say this though: the cauliflower pizza does require a bit of work, so it’s not a bad idea to prepare your dough even a day in advance. You could also possibly freeze it, but I’ve never done that. It’s mainly the ricing, cooking and squeezing the water from the cauliflower that takes some time. Once that is done, it’s not a lot of work. Unfortunately there is no version of this that has worked for me without egg, so apologies to my ‘pure veg’ friends. Parchment paper is also your best friend in this recipe: grease it well with a bit of oil and the pizza will be easy to peel off it after it’s cooked. 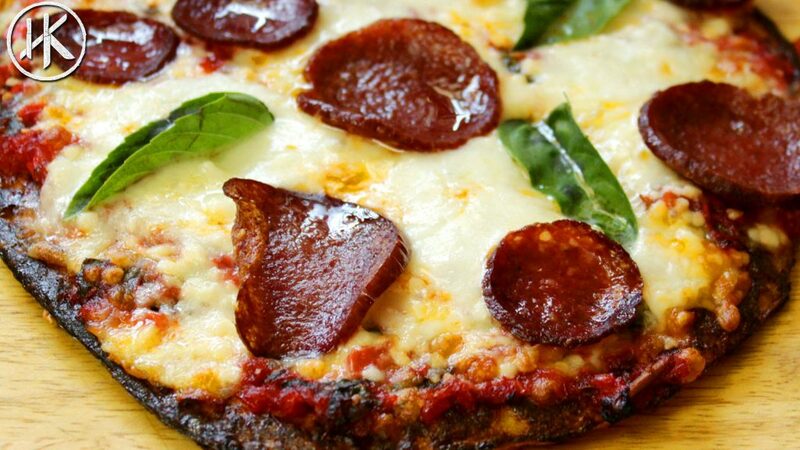 Enjoy this low-carb cauliflower pizza recipe and tell us what your favourite toppings for this are! This recipe makes 1 pizza crust. Get this recipe on myfitnesspal. A low carb, keto, gluten free pizza made using cauliflower. Start with 1 head of cauliflower and separate the florets from the stems. Blitz the florets in the food processor until it's the consistency of fine couscous – fine, but not mashed. Cook the cauliflower in a dry pan for about 5-6 minutes on medium heat till it's cooked through. Remove to a dry cloth or tea towel and squeeze out all the excess moisture. Squeeze well! In a bowl mix the squeeze-dried cauliflower with salt, pepper, cream cheese, parmesan cheese and one egg. On a baking tray lined with parchment paper, place and shape out your cauliflower dough. Remove from the oven, flip over and layer with sauce, cheese and toppings of choice. Bake till cheese is fully melted and you have a glorious keto cauliflower pizza. Make sure you squeeze all the moisture out of the cauliflower. The wetter it is, the less likely it is to crisp up. Oil the parchment paper well to prevent the base from sticking. What can I substitute the egg with in this recipe? There is no substitute for egg in this recipe. Instead make the fat head crust and leave the egg out in that. Can you please let me know what you refer to as the fat head crust? Just wanted to say I’m really enjoying your blog. The writing is great, the videos are edited perfectly, the recipes look delicious and your music sounds amazing. Please keep up the good work and thank you! The white stuff that you used for the topping, maybe pochachini (dont know what that is and how its spelled). Clarification please. It’s bocconcini which is a kind of cheese. You Rock! Your Recipes are Mag! Your Vid’s are great and so much fun, your passion shines thru! Please keep them coming! I am new to keto and your channel. I have watched a lot of the you tube recipes and have tried some of them, they are very good! I have to say I had a rough start. Doing much better now. I’ve lost 23 lbs. in 2 months and have about 20 to go. I thought there was nothing I could do to fight this fat I was gaining. It’s like the fat just melts off. I hate to exercise. Thank you for all your hard work in putting these recipes out. I’m very excited to try more. Thank you for the kind words. Good luck on your journey 🙂 glad you enjoy the recipes. Thank you, especially for the “indian” KETO recipes! I hope that many of your viewers try your “Indian” versions of KETO, we luv em! thank you so much, you’ve helped the quality of our life thru better nutrition! Hey! Awesome kitchen! Quick question…. is there a substitute for Parmesan cheese in the pizza crust? Or is it possible to omit? Hi big fan of your recipes !! This is an issue with your parchment paper, you are probably buying butter paper which is not the same. Or you need to buy a better quality one. For the egg part you can skip the egg completely or add it little by little because maybe the egg is large in size. So maybe just work with it slowly. Made this today. Turned out better than expected! Should we use the packaged tomato sauce? Or we should make it; if we should make it at home plz share recipe. If you can find a low carb sauce then you can use that, it really depends which part of the world you live in. is the 8 grams per the full base. how big a pizza does one batch generally make. 8 grams of what? The recipe makes 1 pizza base about 8″. Might be bigger if you make it thinner. or smaller if you make it thicker.